The victory of Snow Bell in the Prix des Lilas at Chantilly on June 4 credited the young French sire Kendargent with his sixth individual stakes winner from his first two crops. Kendargent's start as a sire has been a lot more impressive than his early career as a runner. In fact, he started six times at 2 and 3 before he was able to gain his first win, scoring over a mile at Maisons-Laffite in April, 2006. He showed improved form through the summer, taking second in the Prix Paul de Moussac (Fr-III) and a fourth in the Prix Jean Prat (Fr-I), but had his limitations exposed in the Prix Jacques Le Marois (Fr-I), where he finished 10th of 10, a position he also filled in the Prix du Pin (Fr-III) on his next start. Sent to the U.S., Kendargent took an allowance over a mile at Hollywood Park, then on his final outing finished second in an allowance/optional claimer at Del Mar. 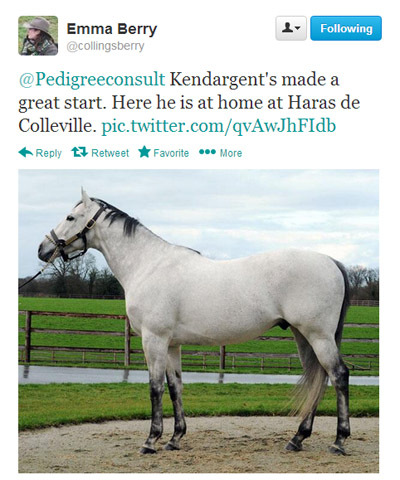 Returned to stand at stud in France, Kendargent did have a pedigree that was a little more prepossessing than his race record. From the Kalamoun/Kenmare branch of the Grey Sovereign line that has done so well in France, he is by Kendor, champion at 2 and winner of the Poule d'Essai des Poulains (French Two Thousand Guineas, Fr-I) at 3, and subsequently sire of group I winners Charge d'Affaires, Keltos, and Literato. Kendargent's dam, Pax Bella, is by the great French stallion Linamix out of a sister to Prix du Jockey Club (French Derby, Fr-I) victor Polytain. The other most immediately noticeable feature of the pedigree is that Kalamoun (who himself has Nasrullah and his sister Rivaz 3x3) appears 3x4, the second cross coming through Bikala, sire of Kendargent's second dam. Perhaps not surprisingly, Kendargent did not exactly have breeders lining up to send their mares when he retired to stud, and his first crop returned just 19 registered foals. Only seven of them made it the races, but they included Restiadargent, who took the Criterium de Maisons-Laffitte (Fr-II) and Prix d'Arenberg (Fr-III), and Prix Eclipse (Fr-III) victress Kendam. Kendargent's first foals must have caught the eye, as his second crop (now 3-year-olds) numbered 52. To date, 25 of them have hit the track, and 12 of them are winners, including not only Snow Bell but also the Prix de la Grotte (Fr-III) captress Kenhope; Kensea, who took the Prix Herod; and Onedargent, successful in the Prix Isonomy. In all, that comes to six stakes winners from only 32 starters from his first two crops (18.75%). He currently stands at Haras de Colleville for a €6,000 fee. Kendargent's success rate might be striking, but equally striking is his affinity for the Rough Shod II/Dalmary family, usually in combination with Northern Dancer. Restiadargent (TrueNicks A++) is out of a mare by Montjeu (by Sadler's Wells, who is out of Fairy Bridge, out of Special, out of Thong, out of Rough Shod II) and is inbred to Bikala (with three crosses). Kendam (TrueNicks A++) is out of a mare by Indian Rocket (by Indian Ridge, by Ahonoora, by Lorenzaccio, who is from the Dalmary family). The second dam is by In the Wings (by Sadler's Wells), and the third dam is by Thatching (who goes back to Dalmary in direct female line, and is by Thatch, a brother to Special, the granddam of Sadler's Wells). Kenhope (TrueNicks A++) is out of a mare by the little-Known Chato (by Local Talent, a son of Northern Dancer), but the granddam is by Doulab (by Topsider, by Northern Dancer from the Rough Shod II family). Kensea (TrueNicks A++) has a dam by Gold Away (by Goldneyev, by Sadler's Wells' three-quarters brother Nureyev), and is also inbred to Kendargent's grandsire, Kenmare. Onedargent (TrueNicks A++) has a dam by Act One (by In the Wings, by Sadler's Wells) and a second dam by Niniski (by a son of Northern Dancer, with a second dam by Ridan, who is out of Rough Shod II and is a brother to Thong, the granddam of Nureyev, and third dam of Sadler's Wells). Snow Bell is out of a mare by Xaar (by Zafonic, by Gone West, and the first Kendargent stakes winner out of a Mr. Prospector line mare), but her second dam is by Entrepreneur (by Sadler's Wells). For good measure, Kendargent has one other stakes horse, the black-type-placed Princedargent. His dam is by Fairy King, a brother to Sadler's Wells. With this kind of a start, Kendargent is going to be attracting bigger and better books in the near future, and it's a fair bet that a high proportion are going to carry Sadler's Wells, Fairy King, Nureyev, and others from the Rough Shod II/Dalmary family.